Fangirl Review: Valiant Marks The Biggest Release Dates of 2017 with “X-O MANOWAR WEDNESDAYS" and the X-O MANOWAR 2017 CALENDAR! Valiant Marks The Biggest Release Dates of 2017 with “X-O MANOWAR WEDNESDAYS" and the X-O MANOWAR 2017 CALENDAR! Valiant is proud to announce that, beginning on March 22nd with the release of the all-new X-O MANOWAR #1, the fourth Wednesday of every month will officially be "X-O MANOWAR WEDNESDAY" – a consistent, monthly on-sale date that will include the latest issue of X-O MANOWAR alongside a brand-new launch title, jumping-on point, or key issue arriving from the best-reviewed publisher in comics! Across each and every fourth Wednesday in 2017, Valiant will now be giving fans at least two reasons to visit their local comic shop – beginning with the most important title of the year, X-O MANOWAR #1, arriving in stores on March 22nd right next to BLOODSHOT REBORN #0! To support this unprecedented move and to reiterate Valiant's commitment to building X-O MANOWAR's brutal new beginning across 2017, Valiant is giving fans and retailers the tools they need to never miss an “X-O MANOWAR WEDNESDAY” with the X-O MANOWAR 2017 CALENDAR – coming free to all participating retailers in the United States, Canada, and Europe! 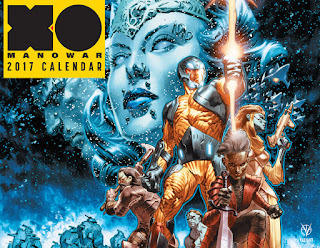 Marking the release date to every issue of X-O MANOWAR in 2017, this one-of-a-kind calendar comes complete with reminders highlighting the Initial Order Deadline (IOD), Final Order Cut-Off (FOC), and "X-O MANOWAR WEDNESDAY" for the first year of X-O MANOWAR – the EPIC NEW ONGOING SERIES from New York Times best-selling-writer Matt Kindt (Divinity, Ninjak, Mind MGMT) and a rotating cast of powerhouse artists, including Tomas Giorello (4001 A.D.: War Mother, Bloodshot Reborn), Doug Braithwaite (Armor Hunters, Bloodshot U.S.A.), Clayton Crain (Rai, Carnage), Ryan Bodenheim (The Dying & The Dead), and Mico Suayan (Bloodshot Reborn), spanning the series’ first year and beyond! Packed with explosive artwork from some of the finest talents in the industry – including Lewis LaRosa (Bloodshot Reborn, Savage), Kenneth Rocafort (The Ultimates), Mico Suayan (Bloodshot Reborn), J.G. Jones (Final Crisis), Kaare Andrews (Astonishing X-Men) and more, the X-O MANOWAR 2017 CALENDAR is a dazzling display item that will attract customers near and far! Retailers hoping to take part in X-O MANOWAR’s landmark takeover in 2017 and beyond will be eligible for the X-O MANOWAR 2017 CALENDAR based on their Diamond discount tier. For more information, retailers should contact their Diamond representative or the Valiant sales team (retailers@valiantentertainment.com). The X-O MANOWAR 2017 CALENDAR will also be available for free to all retailers attending this year's ComicsPRO meeting in February. A stunning new beginning for Valiant’s most enduring icon launches into comics everywhere on March 22nd with X-O MANOWAR #1 – part one of “SOLDIER," a punishing, three-issue introduction that will push Aric of Dacia beyond the farthest limits of our galaxy…and into the brutal opening salvo of the ultimate X-O Manowar tale ever told!